It’s tough these days raising kids. All they want to do is sit in front of a screen and play video games. Mouths agape, they are like drooling (“Not on the keyboard!”) zombies; eyes fixated on their computer, tablet, or cell phone. And when it’s time for them to turn it off, well, I imagine the ripping duress of a bikini wax without wax would be less painful for adults. It’s like a drug.Suffice it to say, this screen addiction is putting us parents on edge. We’re worried about our tech-crazed offspring and their inability to disconnect. Then again, maybe it’s not all that bad. Growing up, we had Walkmans, boom boxes… remember the hand-held electronic football game from the 70s? Man, to have one of those again. But I digress. In the end, maybe our kids aren’t doomed to live soulless lives roaming the earth in a meaningless mucus of mindless screen staring. Perhaps it’s time for a paradigm shift on our part. If we look hard enough, we might find a glimmer of positivity buried deep within the green toxic-colored glow of modern day gadgets. But before getting to a few plausible pluses, let’s first dispel of a couple of bogus benefits. Of all the possible upsides of computer games, this is not one of them. 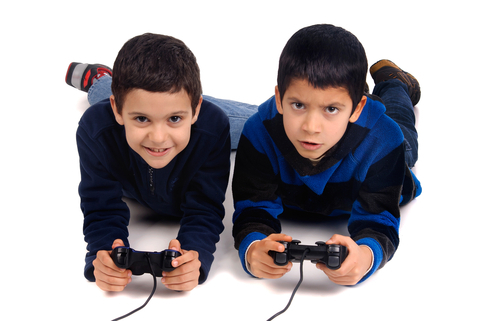 Tennis forehand, boxing jab, baseball swing; dancing games aside, kids can play most video games from the couch. Thus, it’s a stretch to state that video games will help kids’ fitness level. Almost equally outlandish, some claim that historical backdrops and math games teach kids in a fun way. Hogwash! Kids are too involved in “winning” the game to actually take notice of any embedded learning potential. In fact, and by definition, learning virtually is not real learning, real understanding, or real comprehension. Computer games that claim to offer such educational perks are engaging in a marketing ploy. False assertions aside, video games do provide some pluses. A more convincing pitch concerning the cerebral betterment from computer games is cognitive development. Computer games almost always involve some sort of situation problem solving that becomes more complicated via ascending levels of play. Action video games require multi-tasking and decision-making skills as players navigate their character through quick changing scenarios that require split-second movements and options. Lastly, hand-eye coordination is enhanced via video games. Visually scanning a very busy screen while navigating your character with the keyboard requires tremendous coordination. Video games are an effective form of distraction for kids who are enduring physical pain, whether it be from a visit to the hospital or something as relatively benign as the flu or high fever. The games help get their mind off whatever ails them for a while. This is not the same as avoidance or denial; in other words, the kind of distraction that masks emotional pain. Rather, the excitement of video games increases adrenalin, which in turn dulls physical pain. Board games are often cited as great family fun, a way to bring kids and parents together around the table. Video games are a more updated way of such bonding. There are multi-player games that can involve young and old alike. Parents rarely enjoy playing board games, so why not redirect that displeasure toward something more modern and something your kids prefer. After all, it’s still family time. And even if parents don’t want to play, video games provide a sense of bonding between friends via teamwork and cooperation. Many games require players to work together to achieve a common outcome. Players need to work as a team to defeat an opponent or complete a quest. In the end, video games are here to stay. As they become more detailed and more complex, they will become even more prevalent and captivating. Thus, trying to incorporate them into our kids’ routines instead of banning them or considering them a waste of time is the way to go. For one thing, denying kids these games will somewhat alienate them from their peers. Secondly, video games provide benefits that match our own childhood ways of having fun. Life is changing. And as we adults rotate and jab our thumbs to get our own screen glowing fix, maybe we should take a step back and acknowledge that our kids – despite video games being their drug of choice – aren’t “going to hell in a bucket,” to quote The Grateful Dead. And if so, at least they’re enjoying the ride.